For a child (or adult) with Autism, routine is everything! Thankfully for us, Shaun is not quite as rigid as some. However, there are a few things that he has to have a certain way. He must always sit at the same seat to eat (if I mistakenly put his chair in the wrong place he'll move it back)...little things like that! He also believes that the TV must be on at all waking hours, regardless of if he is actually watching it, it has to be on. First thing in the morning or when we walk in the door-TV on. Simple enough, right? I like background noise myself so this doesn't usually bother me. But then there are afternoons/nights like last night. I'm sure this has probably been on the news, but for those who were not aware, most of Southern California all the way to Yuma, AZ and part of Northern Mexico lost all power. As far as I know, there are still places without. Thankfully, ours came back on last night, but for 6 long hours nothing. At the beginning, Shaun was in ABA and didn't realize anything had happened. Once he realized the TV was 'broken' and the iPad was dead and couldn't be charged...well, needless to say, he was not a happy child!! California traffic is bad enough when the power is on, I could only imagine how bad it would be with very few stoplights (only a few were on generators and still going), but being the Scentsy addict I am, we no longer had candles in the house, and only one small flashlight. With the news saying it could be out well into today, tomorrow even, we knew we had to venture out and try to find a place open to get what we needed. Off to Wal-Mart we went. Closed. Next stop, Target. They were open thankfully. As we headed to the camping department for flashlights and lanterns, I suddenly remembered something. While looking for birthday gifts a few weeks ago, we'd spotted some Target exclusive glow in the dark Thomas Trackmaster sets. So while the crowds filed to get lighting sources, we made our way in the dark to the toys, and sure enough, they still had them! Shaun chose 'Thomas Midnight Ride' and we were back on our way, getting what we came for...armed with a lantern and a few more flashlights, we headed home. I was actually pleasantly surprised with the traffic! At that point, people were not rushed, were being courteous on the roads, etc...were we still in California!? I did hear that later though it turned into craziness!! We set up Shaun's new toy and set up our new lantern and Shaun played quietly all afternoon, until falling asleep watching his trains go round and round the tracks. He even asked me at one point to play WITH him, which NEVER happens. I'm not sure if it was just because it was a new toy in general, or if it was the fact that it did glow but either way, it made what could have been a long, meltdown filled night quite peaceful. Best idea ever!! And that's our California Blackout 2011 survival story! We made it, in one piece and without driving each other crazy!! Any other SoCal people out there? Would love to hear your stories! 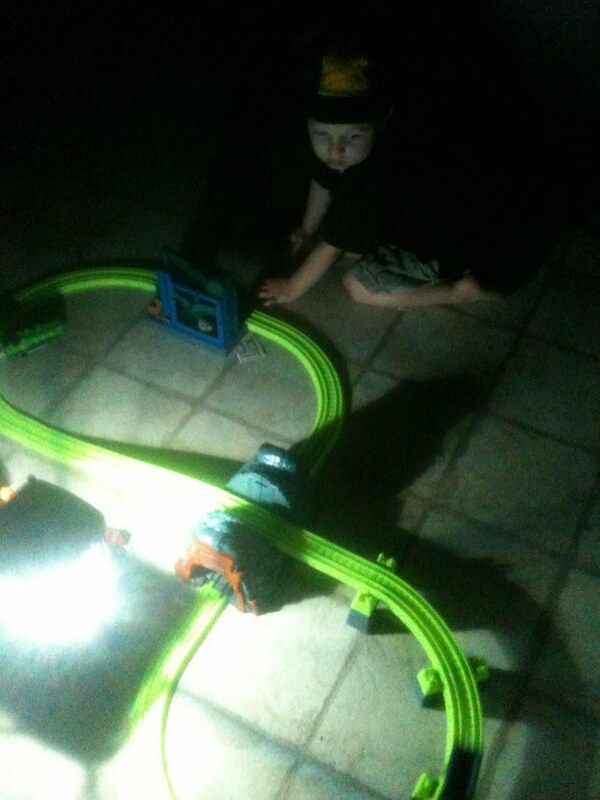 Glow-in-the-dark trains tracks sounds awesome!